China has just launched the fastest express train in the world on the longest track on earth. At a speed of around 400 km/h, this locomotive is so smooth that even a standing cigarette won’t be toppled. It ran from the central city of Wuhan down to the south coast in a record of less than 3 hours, compared to the 10 and a half hours that it normally used to take. This is not something new for the Chinese, and if you’ve been to Shanghai then you know what I mean. They have the Maglev train that takes you from Shanghai airport to downtown at a speed topping 432 km/h. Posted: December 10th, 2009 under Cultural, News. Chinese meteorologists say they brought about Beijing’s earliest snowfall in a decade, after seeding rain clouds with silver iodide to ease a drought. The Weather Modification Office sprayed clouds with 186 doses of the chemical to bring rain for the wheat crop, the Beijing Evening News said. But the arrival of a cold front caused heavy snow to fall, disrupting road, rail and air travel. Cloud seeding is often used in China in an attempt to bring on rain. The country’s north is prone to droughts, while the south is often flooded. Posted: November 3rd, 2009 under News. Even though Ferenc Cakó is an avant-garde in sand animation, this is quite different. To celebrate 60 years of communism in China in the beginning of this month, two artists have created a picturesque sand painting. Yang Qi and Li Yin have spent two weeks grinding and dying the sand red to recreate key moments from the past 60 years. Posted: October 20th, 2009 under Arts, Cultural. While I was browsing through my folders, I bumped into a picture I took during my stay in Shanghai in 2006 that made me rethink of the cultural differences between East and West. The picture, shown below, shows a sign of ‘No Spitting’, which prohibits people to spit. Eventhough spitting for the Chinese goes back five millenia, it is now regarded by the government as an obnoxious habit, and needs to be eradicated. Despite continuous advise from medical staff, the fact that spitting in public was a health hazard really hit home when the SARS virus wreaked havoc in the country in 2003. Guangdong province then introduced campaigns on making public spitting illegal. Fines are now imposed in Guangzhou, Shanghai and Beijing. 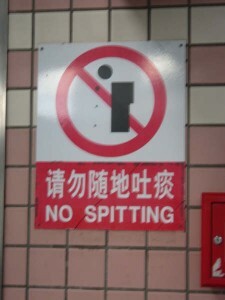 The anti-spitting drive also intensified before the Beijing Olympics in 2008 when the capital city devised a ‘No Spitting Day’ to eradicate a top etiquette no-no. But even with all that, the number of spitters remains very large. Posted: March 10th, 2009 under Cultural, Entertainment, Knowledge.